The Upbeat Dad! 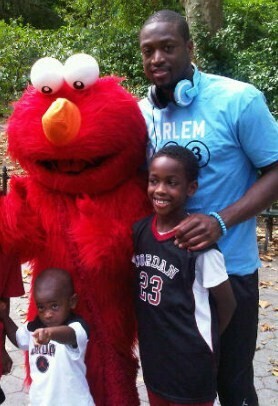 : NBA Star Dwyane Wade’s Got His Priorities Straight! NBA Star Dwyane Wade’s Got His Priorities Straight! Miami Heat basketball superstar, Dwyane Wade, is easily one of the top 5 players in the National Basketball Association. The shooting guard is electrifying as he displays his skills each time he steps on the basketball court. 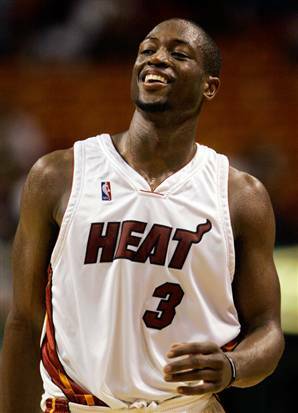 He led the Heat to the 2006 NBA championship, being named Finals Most Valuable Player (MVP) in the process. He’s well on the way to becoming a first-ballot Hall of Fame inductee. This season he has teamed up with two time league MVP Lebron James and Chris Bosh to form, what they believe will be a dynasty in South Beach. As a Miami resident, needless to say, I’m a huge fan and I do hope what they envision becomes reality! When I read this, I had to do a double take. Did this basketball icon just say that? In a league where many of the athletes are notoriously womanizers with multiple kids from different women and are absent in the kids’ lives, did he really say that? This was really a breath of fresh air to see. You might be aware that Wade recently went through a messy divorce – one that became final this summer. No doubt, it took its toll on him. With his busy schedule, he has had to incorporate court appearances for his divorce and also for some other legal issues having to do with business deals gone bad. Yet, he has remained focused on crafting his gift as an athlete and the special gift of his children. It’s one law nature knows. Wade’s marriage produced two boys. The divorce has been finalized but the custody battle is just heating up. Yet, when all is said and done, Wade and his former wife will remain parents of these two young sons – who both need the love and care that their mother and father can give. Sure divorce can get messy – I know that from personal experience. But when the dust settles and the marriage is over, the children remain. I speak of this matter, not endorsing custody of the children to Wade or his former wife. Rather, I’m saying that the kids need both parents and for Wade to even seek custody of them is commendable. How often have we heard of athletes who have to almost be dragged into court so that they would pay child support for their kids who they hardly know? Even this summer, I heard an interview with a New York Jets player who has multiple children with different women and he literally could not name all of his kids. How frightening! Have a great and upbeat day! Very commendable and admirable. Keep doing a GREAT job Dwayne!!! On his behalf, thanks Andrea! Rod, Great Job I am glad you are in our corner. "....to even seek custody of them is commendable." However is it practical. He is on the road most of the town and when he is not he is partying like a bachelor. Is it in their best interest to be taken away from their mother to be looked after by a host of nannies who are just doing a paid job? I have no doubt he loves his sons very much but with fully custody can he be a full time parent? It seems very immature when a person promises to 'sacrifice' his partying if given full custody. It should not be a sacrifice but a joy to look after your own. He was given temporary custody but most of their time was still spent with their mother while he could be seen at most events partying it up with people who have their own self interests at heart. As a good father he should also take the high road and not react as he does to his ex-wife. He should understand that his ex-wife is in pain and hurting (after all he has experienced this when his parents divorced and his mother took it badly)and his in your face comments and parading all over town with the 'other' woman exacerbates this. He needs to break this cycle and be a good role model to his sons. Everything he does is on the internet and one day his sons will read it and judge him because I'm sure they can sense their mum's pain and it cannot be good for them. I recently watched 50 Cent on 'Food for Thought' and when talking about his son's mother - he said he does not say bad things about her to his son because he realises that it pushes him away from him. Now that is a man who has matured as a father! Dwyane at the moment seems to be distracted by people who are in thrall of his skills, in awe of his money and photo opps. As long as these people get what they want they will not give him any good advice or tell him where he is going wrong. He will continue walking around thinking he has robes made from cloth spun from gold thread like the emperor in the 'Emperor's New Clothes' untill someone points out he is actually naked. (we all know who the weaver is). I do not condone his ex-wife's behaviour (subject for upbeat mum) but he needs to mature because right now he is very lost and it is sad. I would like to see him spending more time with his children than being someone's meal ticket. He has the best intentions but he still wants a good time. Great post. This is what I teach young men everyday. You must remain in the lives of the children you bring into the world. Not all marriages work but the children you bring in the world are "forever". If they are young boys, then the father is extremely important. Much Love for the post to D. Wade. He just move up the latter with me! Not trying the rain on the Dwayne Wade love fest. 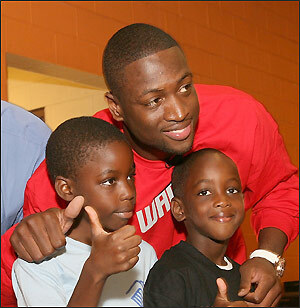 But, making a big deal about Dwayne Wade taking care of kids, isn't this expected? This reminds of a skit by black comedian Chris Rock. "I take care of my kids! You're supposed to! What do you want...a cookie?" As fathers, taking care of our kids is a given. This also applies to professional athletes. Why are all the negative comments by someone named "Anonymous"? Dwane Wade is my HERO!